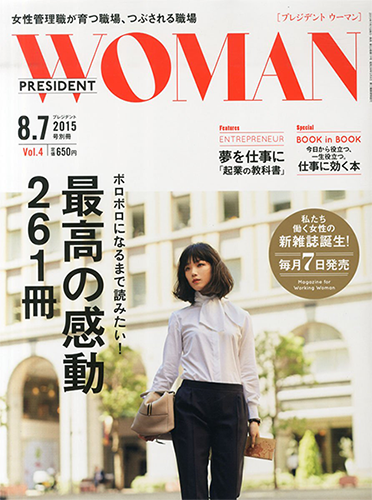 The 2015 President Vol 8.7 supplement, “PRESIDENT WOMAN　VOL. 4”, featured comments from our company’s e-book publishing business “Ano Publishing”. “Ano Publishing” was asked to comment about how to convey the appeal of “rare books”, which currently, in the e-book publishing market, have not been able to be made into books. The e-book market is rapidly growing and it is expected to be a market worth 279 billion yen by 2018, and in recent years, niche books and technical books have also been gathering attention. It is now on sale at bookstores nationwide from July 7. We would like you to take the opportunity to have a look at “PRESIDENT WOMAN VOL. 4” and learn about the appeal of e-books.